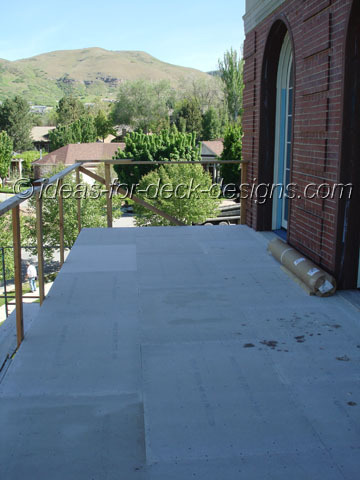 If the deck is smooth, it's time to install cement board over top. Cement board like Durock or other brands is a very stable material and makes an excellent substrate for a tile deck. A bed of thinset mortar must be applied. This is a crucial step. The boards then have to be set close together but not touching. A 3mm (1/8") gap is best. Then use the recommended screws set at 6" apart along the perimeter and 8" on joists. The mortar should cure properly before you apply the membrane over the cement board. Although this installation was done during the summer months, you still want to make sure the cement board is kept dry. Cover the area with a waterproof tarp or heavy plastic until the membrane is ready to be installed.